The CircuitWorks range of syringe packaged conductive greases recently launched by Intertronics meet the needs of many electrical and/or thermal conductive applications. These include lubrication of substation switches or circuit breakers, heat dissipation from transformers, low or medium speed sliding contacts, static grounding on seals or O-rings, extending the life of rotating switches, thermal coupling for any heat sink device, non-flammable protective coating, high voltage corona protection and improving readings on contact type thermocouples. The silicone free compounds will not harden or dry out, while exhibiting excellent thermal conductivity and dielectric properties. They are non-corrosive and exceed ML-C-47113 for thermal conductivity, offering excellent heat transfer between circuit components and heat sinks without any silicone migration. The silver conductive grease may be precisely applied to provide superior electrical and thermal conductivity, lubrication and protection. 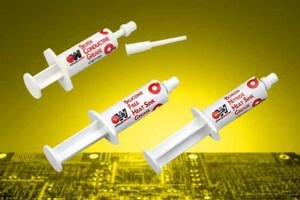 Boron nitride heat sink grease provides maximum thermal conductivity with superior dielectric properties in a silicone free compound which does not harden or dry out. It is also electrically insulative, non-corrosive and non-flammable, as well as thermally stable from -73°C to 200°C while exceeding MIL-C-47113 for thermal conductivity. Silicone free heat sink grease is especially of value where the presence of silicone would be an impediment to the application of coatings or other processes. This silicone free compound exceeds MIL-C-47113 for thermal conductivity, and like its stable mates will not harden or dry out, while providing excellent thermal transfer between circuit components and heat sinks.